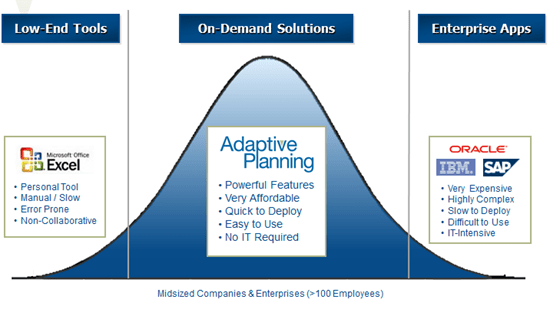 I’ve written in the past about Adaptive Planning the corporate performance management (CPM) vendor that has been enjoying stellar growth off the back of more widespread adoption of cloud applications within mid sized organizations. I recently spoke to Adaptive Planning to get a run down on their upcoming release and corporate performance to date. First some numbers – Adaptive Planning is boasting of over 1000 customers and 25000 individual users. These sales have been delivered through over 200 partners, the highest profile of which is NetSuite. All of this has added up to a 100% compound annual growth rate between 2007 and 2010. As a reminder – Adaptive Planning sees itself filling the space between “analysis by excel” and the expensive BI tools from Oracle, IBM and SAP. This new release focuses heavily on deep reporting capabilities. Also being catered for is team collaboration within reporting so that annotations and discussions can occur in real time and across an organization over real-time data. Transaction Reporting & Analysis – tight integration of transaction-level detail from other enterprise applications, located both on-premise and in the cloud. Report Annotations to enable collaborative explanations, comments and questions on reports. CPM is a high growth area, research from Merrill Research suggests that 61% of respondents currently don’t use a CPM solution but that 69% are intending on using it over the next year or two. These sorts of surveys are always fraught with inaccuracies but it’s a fair comment to say that driving deep insights over corporate financial performance is going to be a safe bet moving forwards. The changes Adaptive Planning are introducing aren’t earth shattering, but they’re positive iterations of their already strong product offering.